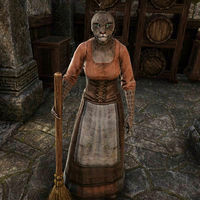 Ensi is a Khajiit who can be found in the Oak and Crosier. When you speak to her, she says, "Between the vapors from the fissure and the dust from the earthquakes, cleaning this place is a never-ending task. Excuse me, please." This page was last modified on 31 August 2014, at 04:51.